Yesterday, my son and his classmates starred as historic influencers. Guests listened to scientists Albert Einstein and Sir Isaac Newton describe their obsessions with formulas, while engineer Henry Ford (my son) told of when he built an entire car by himself and later, with the help of thousands of employees, produced affordable cars in a single location (he scoffed at the idea of importing parts from other states, let alone other countries…wonder what he’d think of our manufacturing models today, less than 100 years later). 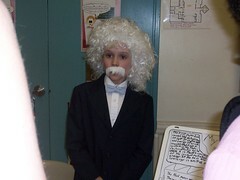 Based on the wealth of information my son absorbed and his new-found personal connection to Ford, I’d like to see all the wonderful science teachers* out there offer similar “wax museum” projects at your schools. Assign subjects (scientists, mathematicians, engineers) to your students and have them research their lives, write reports, slip on their personalities and role-play for two minutes. Be sure to include cool scientists to help shatter the geek image! We need more kids to get jazzed, not turned off. See Obama’s recent, related remarks.